Browse the ShopTrue list of eligible partners and find a retailer you'd like to purchase from. Click on "Shop now" to transfer to the retailer's website. We'll track your purchases automatically and calculate how many points you've earned. Your points will show in your ShopTrue account as "pending" within 5 working days. If your pending points aren't appearing in your ShopTrue account after 5 days, please contact us. We'll validate your purchase with the retailer and update your account to show your points as "approved". It takes up to 60 days for a retailer to acknowledge and approve a purchase. Your purchases are subject to the retailers' terms and conditions. 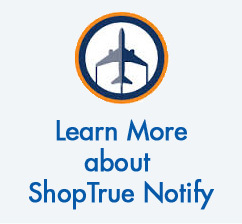 All "approved" points will be credited into your TrueBlue account within 10 days of receiving retailer approval. Enable your Internet browser cookies to be sure your points are awarded to your Account. Cookies are used to track your path from the ShopTrue to the retailer’s website and enable us to allocate the points you earn from your purchase to your TrueBlue account. For more information on cookies click here.